A reanalysis of observations of Uranus made with the Gemini-North Telescope in 2010 has resolved one of the most puzzling questions concerning the planet - what are its main observable clouds composed of? An unequivocal detection of gaseous hydrogen sulphide, H2S, above Uranus's main cloud deck confirms that the abundance of hydrogen sulphide exceeds that of ammonia in Uranus's atmosphere and that the main cloud deck observed is likely composed primarily of H2S ice. 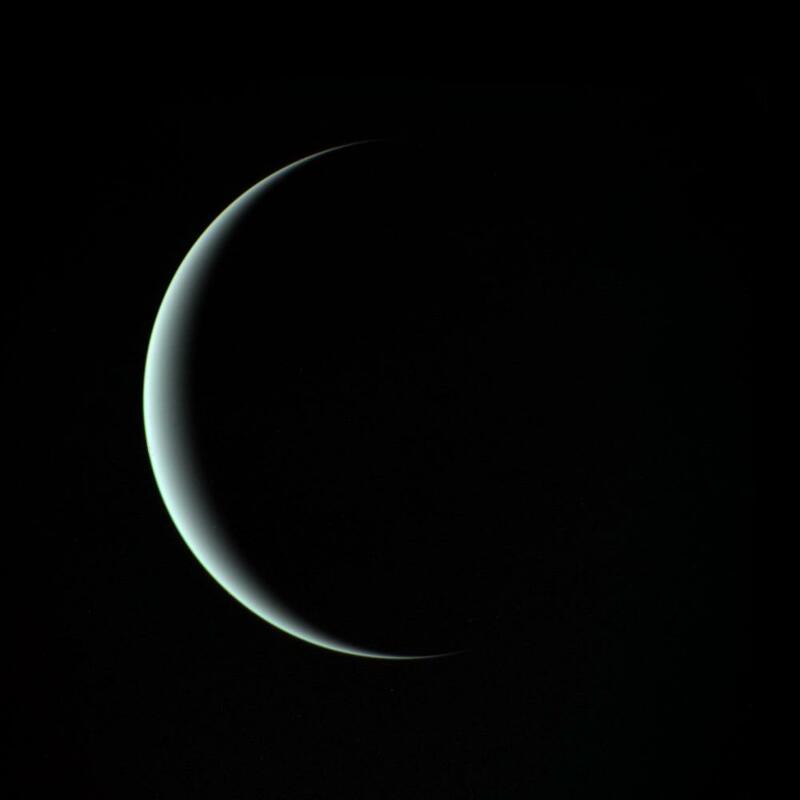 Uranus's limb as seen by NASA's Voyager 2 spacecraft in 1986. Why the abundance of ammonia should exceed that of hydrogen sulphide in Jupiter and Saturn, but be less than that of hydrogen sulphide in Uranus is a mystery. Irwin suggests, “This observation supports the view that Jupiter and Saturn formed closer to the Sun than Uranus (and probably Neptune) where the warmer temperatures in the Sun's circumstellar disc meant that hydrogen sulphide was preferentially in gaseous rather than icy form. Hence, H2S was likely less readily accreted than it was at Uranus (and Neptune) where lower temperatures meant that both constituents were probably in icy form.” The discovery also places constraints on solar system formation models, in which planetary embryos can migrate to different distances from the Sun as they form. The fact the Jupiter/Saturn and Uranus/(probably Neptune) have such clear bulk composition differences suggest that such migration is likely to have been limited in our own solar system. Although the main clouds are likely composed predominantly of H2S, the particles in them seem to be much darker and less reflective than would be expected for pure H2S ice. This suggested that the ice particles in these clouds are coated or mixed with complex hydrocarbons created by the photochemical destruction of methane higher in Uranus's atmosphere and which then 'drizzle' down to the cloud layer. Hydrogen sulphide is the gas that gives rotten eggs their delightful smell, and it is also incredibly poisonous. While the results set a lower limit to the amount of hydrogen sulphide around Uranus, it is interesting to speculate what the effects would be on humans even at these concentrations. “If an unfortunate human were ever to descend through Uranus’s clouds, they would be met with very unpleasant and odiferous conditions.” But the foul stench wouldn’t be the worst of it according to Irwin. “Suffocation and exposure in the very cold (-200C) atmosphere made of mostly hydrogen, helium, and methane would take its toll long before the smell,” concludes Irwin.